Jaq Chartier's works represent, in a fairly abstract manner, a combination of science (specifically, biology) and technology. Often, her works are somewhat experimental in nature... Jaq uses them to develop different color effects. This particular work is inspired by a scientific process known as DNA gel electrophoresis, which is used to separate and visualize DNA chains. Basically, DNA gel electrophoresis uses an electric field to pull DNA chains (which are negatively charged) through a gel composed of agarose or polyacrylamide, toward the positive pole of the electric field. Shorter DNA chains move more quickly through the gel than longer chains, so you end up with a "ladder" of chains, spread out by size. The chains can then be visualized by adding ethidium bromide, a dye which binds to the DNA and fluoresces orange in ultraviolet light. Interestingly, because of the composition of its materials, this work may change slightly over time, as colors continue to bleed and spread through the gel. I really like the abstract, yet linear nature of this work, especially the evenly-spaced grid of colored blots, which range in intensity from quite vivid to almost nonexistent. It appeals to the orderly, logical part of my mind. I've always been interested in science, as well, so this work is doubly special. 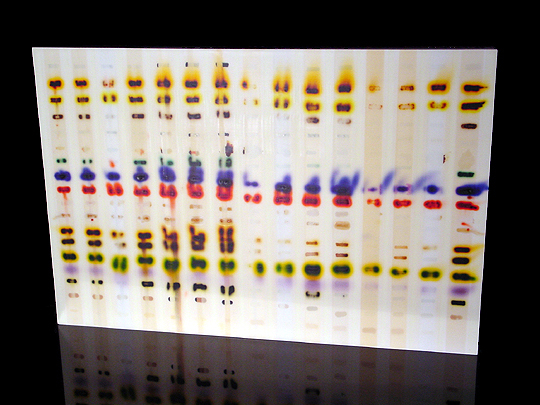 This work was on tour with the exhibition Gene(sis): Contemporary Art Explores Human Genomics, sponsored by the Henry Art Gallery at the University of Washington, from early 2002 through the end of 2004.